The town of Saltlick Bluff is famous for an urban legend. Does the spirit of a young girl wait on a misty cliff-hugging highway for her ride to the prom? In the house on Beech Street a terrible tragedy occurred. Now neighbors won’t look at the place as they pass. Those who live nearby draw their blinds and shutter their windows after dark. What are they afraid of? Hale Hallow Woods seems sinister and menacing even in the light of day. Does a thirst for revenge beat near its dark heart? 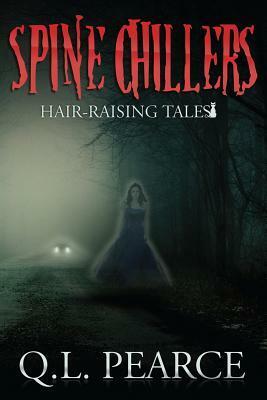 The answers lie within these pages, just waiting to send a chill up your spine! This reminded me a lot of my Goosebumps reading days. It was a very short read though and I honestly wished there was more. I love scary stories, always have and always will. Which is why I jumped at the chance to read this. Short stories all always great in my book because they're usually full of surprises. They always move along at a fast-paced because there isn't enough time to be slow. I really enjoyed reading this but I do wish it was more for my age group. It felt too kiddy for me.